Nashville, the Music City, is a high-value long-weekend destination for Chicagoans in search of good things to listen to, eat and drink. Nashville is about an eight-hour drive, a somewhat longer/way-less-expensive Megabus ride, or a direct flight from Chicago (about $120/round trip). The paradigmatic Nashville meal is “meat and threes”: meat with three sides, like mac ‘n’ cheese, mashed potatoes and beans. There are, however, three other native Nashvillian comestibles that have achieved national recognition. 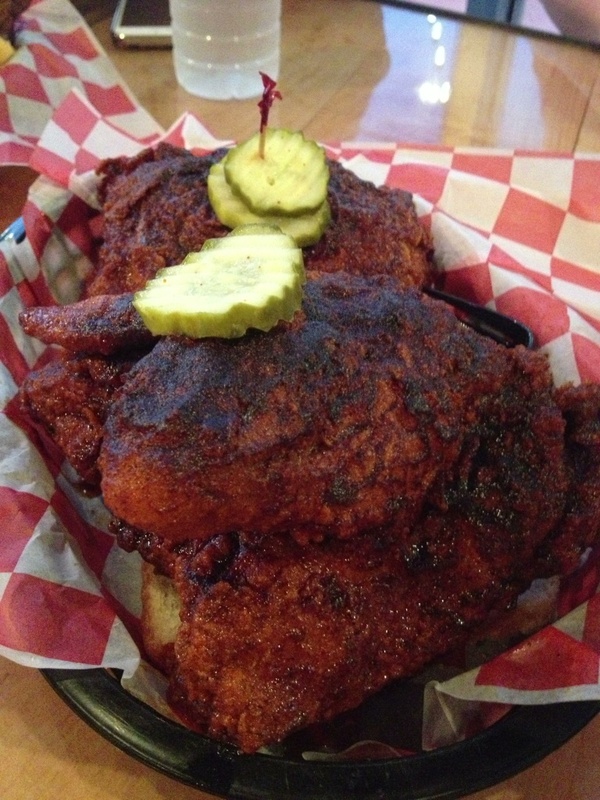 Hot Chicken: Perhaps Nashville’s most renowned menu item, among both locals and tourists, is the Hot Chicken. This sandwich of the fried fowl and hot sauce is enhanced (as are so many Nashville celebrities) by a hard-to-disprove legend. Hot Chicken’s origin story goes a little something like this: a wife, weary of her husband’s philandering ways, prepares vindictive vittles for him after he drifts home from god-knows-where. For this punitive repast, she fries up chicken and serves it, dripping with incendiary cayenne-based sauce, on white bread. Thing is, the s.o.b. enjoys it! He loves it so much, in fact, that he and his brothers start a restaurant to serve it. Thus was born the Hot Chicken, a sandwich that seems to have been first served commercially at Prince’s Hot Chicken Shack (123 Ewing Drive), and which has been recognized by the James Beard Foundation as one of “America’s Classics.” Hot Chicken sandwiches are all over Nashville—we enjoyed a particularly good one at Hattie B’s . The humble meal’s fame has now spread beyond Nashville to places like Zingerman’s Roadhouse in Ann Arbor. Goo Goo Cluster: This extraordinarily popular hometown candy is composed of nuts, caramel, marshmallow and milk chocolate. The company that makes Goo Goo Clusters has sponsored the Grand Ole Opry, Nashville’s premier music institution, for more than sixty years. In Nashville, the candy is unavoidable, which is just fine with us: it’s not fancy, but for a relatively “cheap” candy (about $1.25/piece), ingredients seem high-quality. 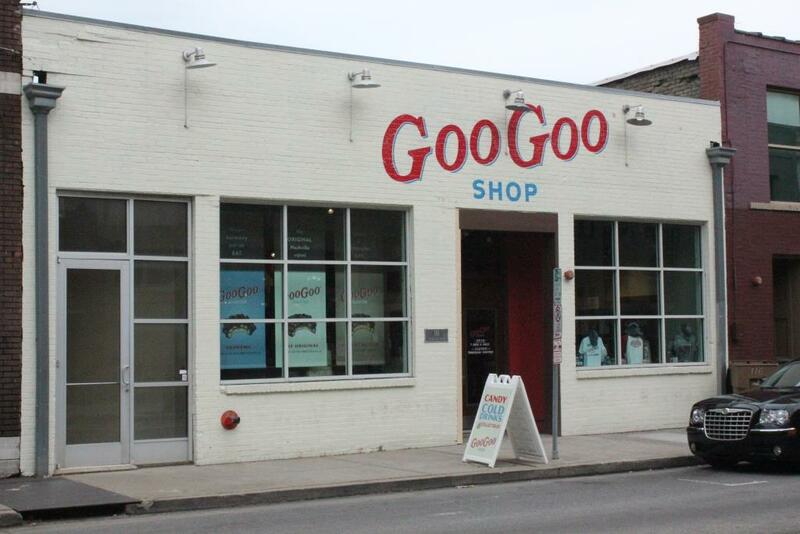 If you stop by the Johnny Cash Museum, and you really should, the Goo Goo Shop is just across the street. It’s the only place you can buy the iconic candy by-the-piece (everywhere else sells three-packs, which honestly is probably the quantity you’re going to want anyway). 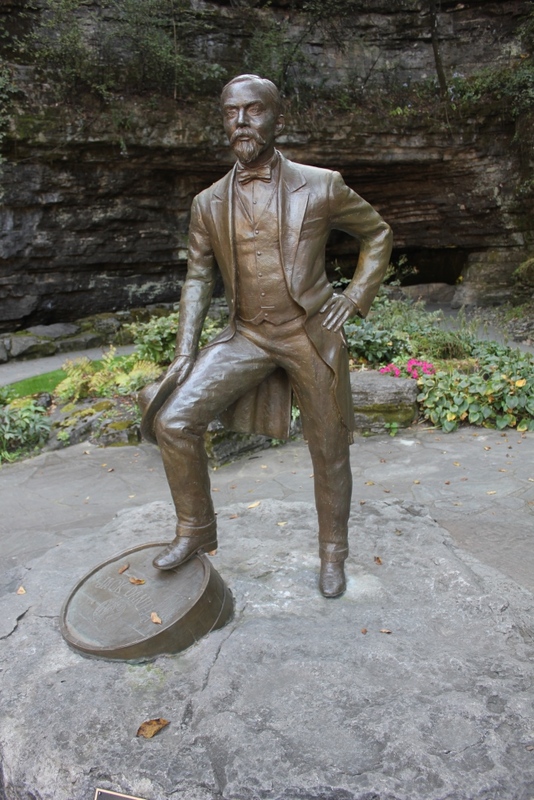 Jack Daniel’s: The Jack Daniel’s Distillery is where this most famous of all Tennessee whiskeys is produced. Lynchburg was chosen as the location for the distillery because it’s close to the Cave Spring, the source of water for the spirit. The Distillery offers daily tours that provide some insight into the manufacture of this particular Nashville legend. You can buy collector’s editions of the stuff at the distillery, though ironically you’re prohibited from buying a shot of Jack in Lynchburg, which is in a dry county. Distillery worker Jason Morgan explains the rationale for Lynchburg temperance: “If we served Jack Daniel’s in town, it’d be like Sturgis (motorcycle rally) every day of the week.” Indeed, there are a lot of bikers in downtown Lynchburg, and maybe it’s best that they restrict their fuel to their gas tanks rather than their bellies. Music, of course, is what has gained Nashville its international reputation, and the city offers a dizzy collection of music-related attractions. Here’s several of the best. Ryman Auditorium: Also called “the Mother Church,” this somewhat small building used to host the early days of the Grand Ole Opry, and it still hosts the show during winter; it’s also a gallery of country music memorabilia, instruments and gaudy garb. Grand Ole Opry: There’s nothing homespun about this sprawling mega-showplace, outfitted with sophisticated lighting and sound systems. It’s definitely worth a trip if only for the fact that it’s synonymous with the Nashville sound. Studio B is the RCA recording space where Elvis Presley recorded more than 250 songs; his presence is still felt in Studio B, which closed the day after he died. Aside from these major music zones, there are a number of raucous clubs and downhome hangouts on Broadway that are elbow-to-elbow on weekends. If smaller, funkier venues appeal to you, you’ll want to stay near Broadway. A good bet in the area is the Omni Nashville, in the same complex as the Country Music Hall of Fame and Museum, and a short walk to the honky-tonks. 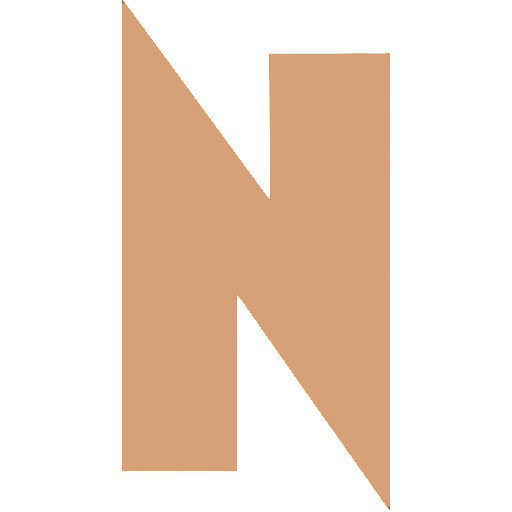 For more information about Nashville, visitmusiccity.com.